If you find yourself in San Marcos looking at artwork contain pigs and cats floating down the river in inner tubes or a bird with a dart through its head, chances are that you are looking at a piece created by J. Rene Perez. A San Marcos local, Perez is known for taking iconic San Marcos settings and filling them with animals moving through them like humans. His work is provocative and challenging, and manages to capture the quirky spirit of San Marcos and San Martians. While his work is challenging, the man behind the work is friendly and engaging. This week I was lucky enough to steal some time out of his busy schedule to ask him some questions about himself and his work. 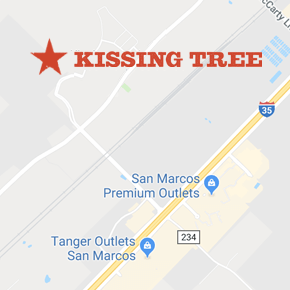 How long have you been living and working in San Marcos? About 34 years. I moved here when I was 10 years old. What inspires your art the most? Life really. Whatever I come across. My cats, birds, scenery. It starts with my photography. I’ll be walking and see something interesting and I’ll take a picture of it. From that photo, I will create a painting or something. Also, sometimes in the middle of the night an idea will pop into my head. I’m not someone who can just do something on the spot, sometimes it takes a while. family, having studied and pursued painting in college. It was “their thing.” When I was 34 my son was about to be born and I had my sister paint his nursery. Well, I was trying to hurry her up because we had only a few weeks left and she handed me the brush and said, “Why don’t you try it?” I stayed up until about 1 am finishing what she had started and I thought it looked pretty good. I was so excited to show my wife but she came in the room later that morning with her water having broken. It was an exciting two weeks after that before I painted anything else. Wow! So then did you begin painting more? Let me say again that I had no idea I could paint before that. During those first two weeks with my son, we spent a lot of time staring at our bedroom ceiling and thought it would be cool to add some color up there. So, I painted some vines that turned out pretty cool. Then, I bought a tiny little canvas with a set of basic colors-brown, grey, green and thought what am I going to do with this? I decided to paint my cat because he’s a tabby and that developed into pet portraits for my friends and family. You’re also really well known for your San Marcos culture inspired art. When did you start on those pieces? painting so I snapped a picture. Because I enjoy the juxtaposition of animals doing human activities, the painted a female pig leaning against the alley wall enjoying a cigarette. Everything sort of evolved from there. When I had my first showing at Jo on the Go in 2009, they expected pet portraits but now it had turned into San Marcos scenes with animals in them. Do you have a favorite piece of art that you’ve created? This is a tough question to answer. I would have say there is one piece that I can’t bring myself to part with and probably will never sell; my Geisha Cat. She was one of the earliest paintings I did and I am very proud of her. But, my favorite can depend on what I’m working on at the time. I’m really drawn to Gustave Klimt and his use of color at the moment. I’ve also always been a fan of Mark Ryden’s work. It’s… interesting and weird but brilliant. Locally, I’ve been inspired by Chicken George Zupp. He’s been a staple of the San Marcos art scene forever and is an amazing person to bounce ideas off of. The way he’s represented San Marcos and its culture is genius. Hmm… this actually changes depending on my mood or where I am in my life. Right now, I would say the Blue Dahlia courtyard is where I’ve been spending a lot of my time. But kayaking on the river early morning when there’s no one else around is pretty special as well. To visit Rene’s website, click here.